The first mention of the name of ‘The Plough’ is the 1871 census. We do however have a lot of evidence to suggest that there had been a beerhouse at this location a lot earlier. The 1840 Tithe Survey shows a house, garden and yard on the the site of where the Plough now stands, but we cannot say for sure whether it is the same building. At the time of the Tithe Survey, this plot (no. 207) was owned by Thomas Nelmes whom we know to have been a pig butcher, brewer and beer retailer. At the time of the Tithe Survey Thomas was living in Bristol and the Plot 207 was occupied by Ezra Amos, listed in the 1839 Robson’s Directory as a beer retailer and cooper. We are grateful to South Gloucestershire Council who allowed us to copy some old deeds relating to this and adjoining properties. Although we don’t have full details, they indicate that the property on which The Plough stands was owned by Thomas Neale who sold it on 24th March 1775 to William Greenwood the younger. On 29th January 1805 the property was transferred from William Greenwood to John Greenwood and then on 25th March 1817 John Greenwood sold it to John Nelmes. A conveyance dated 1848 lists the successive previous occupants of the property as Thomas Neale, John Greenwood John Nelmes, Thomas Nelmes and Abraham Cole (see below). So we know that these people lived in the property as well as owning it. Shortly after 1840 Thomas Nelmes built a detached shop on the junction of St Mary Street and St John Street and this was sold in 1848, together with the house that was being built on land between the shop and the beerhouse. The 1851 census shows that Thomas Nelmes was living The Plough, or a building on the site of what we now know as The Plough. 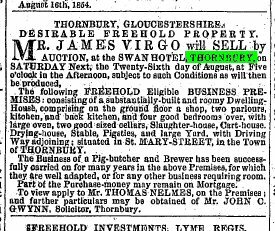 The census shows him as a pig butcher, but the 1849 Hunt & Co. directory shows Thomas was also a beer retailer. This suggests that Thomas was running a pig butcher business and a beerhouse from the premises which came to be the Plough. In August 1854 Thomas the remaining part of his property in St Mary Street. The advert on the left refers to the part of his property which we now know as being The Plough Inn. It confirms that Thomas was using the premises as a pig butcher and brewer. The first definite reference we have to there being a beerhouse on this site in the 1856 Post Office Directory which shows Mark Smith as a beerhouse keeper in St Mary Street. However the fact that both Ezra Amos and Thomas Nelmes were also listed as beer retailers suggests that the place was used as a beerhouse from at least 1839. The 1859 rate book confirms that Abraham Cole was the owner of the property occupied by Mark Smith. Abraham was a maltster who owned and occupied the buildings adjoining The Plough, one of which he used for producing malt. Several indentures in 1859 and 1862 show that although Abraham was the owner he was letting it to Messrs Thomas Arnold and Stephen William Arnold who were the brewers based in Wickwar, whose company became ‘Arnold & Co’. The earliest reference we have found to the pub being called the ‘Plough Inn’ is the 1871 census. Abraham Cole is shown as being the owner of The Plough in the Rate Books of 1876 and 1880. The 1885 rate book shows the owner as ‘Trustees of A. Cole’ following Abraham’s death in 1883 at the age of 73. On 1st September 1886 the inn was put up for sale. 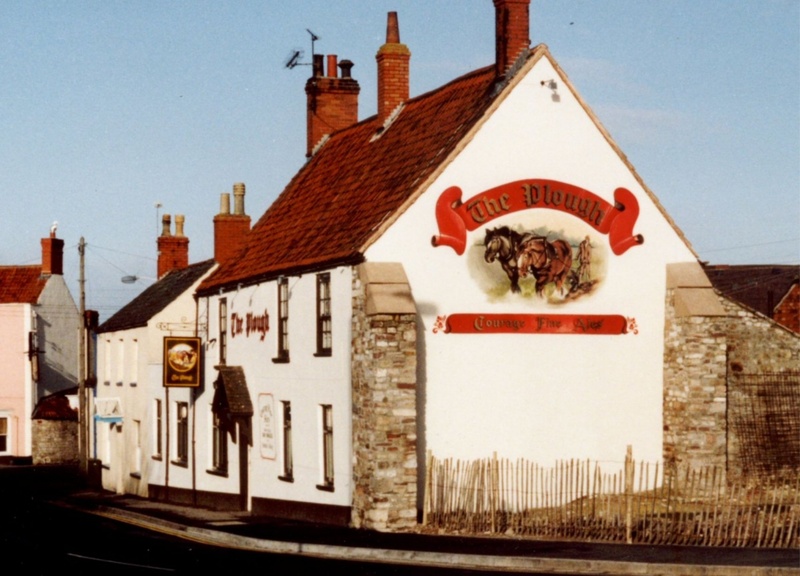 It was described as a ‘All that convenient and well frequented PUBLIC HOUSE known as the PLOUGH INN situated in St Mary Street in the Town of Thornbury and running back to and having an entrance from St John Street. The house contains parlour and sitting room, kitchen or tap, pantry, back kitchen, with large shed, cellars, three bedrooms and attic. The premises comprise a large yard with trap houses, six-stall stable with loft over, harness room, bacon house etc. There is a never failing supply of excellent spring water on the premises. The lot is in the occupation of Mr George Hughes as yearly tenant at a rent of £20 per annum and possession can if required be obtained on the 25th March 1887’. George Hughes, who had already been running the pub for several years, bought it at this time for £470. He continued to own it and run it as a pub until 1891 when he gave up this occupation and sold the pub to Daniel Sykes & Company, a brewery based in Redcliffe in Bristol. Daniel Sykes merged with Bristol United Breweries in 1897 and they continued to own the pub until about 1957 when they were taken over by Georges, another Bristol brewery, and then they were subsequently taken over by Courages. By 2000 it had been acquired by Ushers brewery. During all these years the pub has changed very little. In 1932, the stables and other outbuildings were converted into a skittle alley and it continued as a small community pub relying heavily on darts, skittles and crib evenings with the occasional musical entertainment. The Plough finally closed in June 2011. The Mumtaz Indian Restaurant moved into the building from St Mary Centre where they were located since 1989. The photograph on the right is a thumbnail image of the new business which has repainted the old pub sign to show the Taj Mahal. Please click on the image to see a larger photograph.